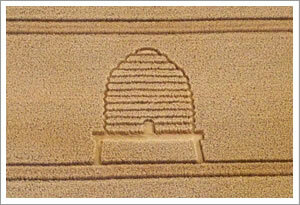 Bees do not sleep and they do not hibernate. Honeycomb was the first chewing gum, sailors used to be given a wedge of honeycomb along with their tot of rum every day. They chewed the honeycomb until the honey was gone and all they had left was wax. Then they spat the wax into a spittoon and the ship's boy collected all the wax at night and melted it down to make candles for the next day. The oldest bee is a fossil which is 35 million years old. Scientists say it is aerobatically impossible for a bee to fly. 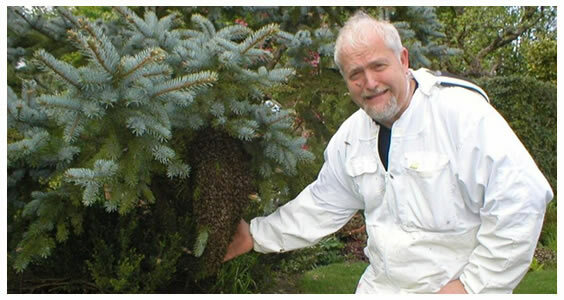 It is said that it takes 300 bees to make 500 grams of honey approximately and between them they would have to fly 2 or 3 times around the earth to collect all the nectar and pollen. 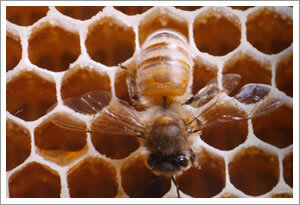 Honey bees flap their wings 1400 times per minute. 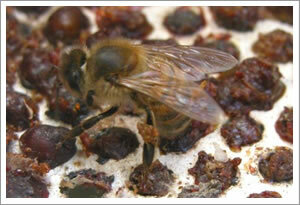 A queen bee can lay 1500 eggs in one day. 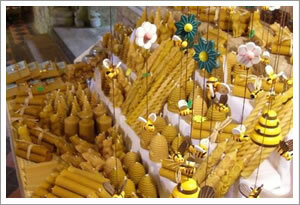 Bees are the only insects which make food for humans to eat. Can you spot the bee on his face? To make the toffee you will need a saucepan, a wooden spoon and a non-stick baking tin about 20 cm square. Put the water, golden syrup and sugar into a saucepan, melt them together on a low heat. Bring the mixture to the boil, stirring all the time. When the mixture has boiled, take half a teaspoon of the mixture and drop it into a saucer of cold water. As soon as it is cool, try and make a little soft ball with it using your fingers. When the mixture will form a little soft ball, add the butter and honey to the saucepan and stir. Boil the mixture again, stirring, until it becomes hard and brittle when you drop a little of it into the cold water, then pour it quickly into the tin and let it cool. Once it is cold, break it into pieces. a saucepan, a wooden spoon and a non-stick baking tin about 20 cm square. Melt the butter honey and sugar together in a saucepan. Stir in the oats until the oats are covered in the mixture. Pour the mixture straight away into the baking tin and cook the flapjack in an oven at 180 C for 20 minutes. Remove the tin from the oven and allow the mixture to cool before cutting into squares. How many words which have something to do with bees can you find in the puzzle below?